Okay, not the best of these issues by far, but Layton’s got credit as both writer and artist. How come we can’t keep everyone around month-to-month? Sorry to backtrack, but the annuals are always placed at the end of issue runs, especially not knowing where this one came into play. There’s not much within the continuity here, however; so other than knowing Angel’s dead where i left off in the single issues, this one’s action doesn’t make much of an effect on the rest. So, the Ruskies want to know how to subdue nasty mutant problem, da? Who better than to call on X-Factor to teach Mother Russia how to deal with their mutant problems. Scott and the rest are shaken, wondering just how to deal with the problem. They’d like to write it off, but find out from Hodge and their contact in the Senate that there’s a mutant Gulag of sorts. How will they save the day but keep their cover?! And as soon as they get to Russia, they’re attacked by mutants. Talk about double-agents! One mutant attacker is shot in the back and Bobby has a hard time keeping his cool. Back in the hotel room, he lets loose, freezing temperatures hopefully neutralize any listening devices. Turns out Angel is flying to meet them at the mutant jail so the rest of X-Factor can rescue the camp. They attend a conference where a Dr. Heinrich woos Bobby with the promise of the ladies. “I guess I’ll have to do my bit for international relations.” What a ham. Turns out Heinrich is the mutant Doppleganger, intent on stealing Iceman’s powers to use them against the rest of X-Factor. Aiming to put him on ice, Heinrich’s men are accosted by other mutants, who are working against the KGB to free their kind. Very neat to see a mutant priest. They make it to the mutant prison eventually, and they find some sort of lab where mutants are kept alive, but brain dead. 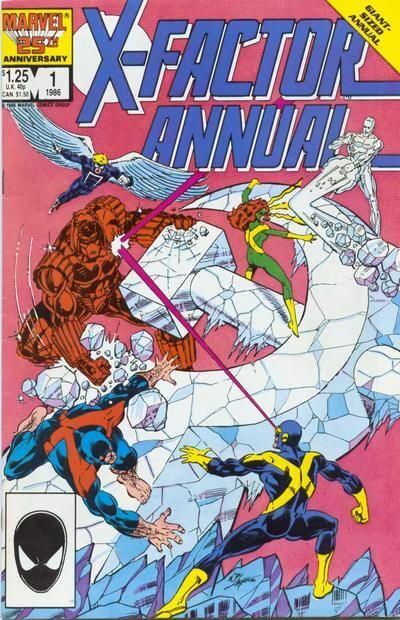 Iceman as a dupe, and he turns the tide by releasing some sort of robot on X-Factor. In the meantime, the real Iceman shows up and heats things up. A neat issue, but awful wordy for the length. Pretty decent conclusion and great over.